Your transcript(s) will start to be evaluated once you submit your $200 enrollment deposit to the Office of Admission Processing. It is normal for this evaluation to still be in progress when you attend SOS. To get a preview for how courses will transfer, please view the Transfer Course Equivalency Tables at auburn.edu/transfercourses. Scroll all the way down, and the transfer tables are at the bottom of that page. These tables will show how courses taken at other institutions will be evaluated for credit at Auburn. If you do not see the course you are looking for in the tables, this means that the course has not yet been evaluated for potential credit. Once you pay your $200 deposit, your courses will be evaluated and reviewed for credit. Please save any specific questions regarding your transfer credit evaluation for Academic Advising during SOS. Your advisor will be able to give you some more specific information regarding your transfer credit and any next steps you may need to complete. Depending upon the courses taken and the familiarity we have with institution, the evaluation process may take time. You are encouraged to submit your confirmation deposit as soon as you have decided to come to Auburn. This will help ensure the Auburn credit awarded will have time to process and show on your record before the SOS Orientation session. For more specific information regarding the transfer credit evaluation process, please visit the Office of the Registrar’s website. To see an initial view of your transfer credit evaluation after you have submitted your confirmation deposit, log into AU Access and navigate to the My Academics tab. Then click the link for your Unofficial Transcript. In the section Transfer Credit Accepted by Institution, you will see how your credits are currently being transferred. Below are some helpful tips to help you understand your unofficial transcript. The credit will be listed using Auburn’s course codes and course titles and not what the course was called at your previous institution. 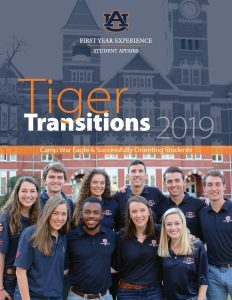 You can use the Transfer Course Equivalency Tables at auburn.edu/transfercourses or your knowledge of your specific grade in each course to help determine what you received credit for and what may still be waiting to be evaluated. PEND 1111 – This course is in the process of being evaluated for potential AU credit; once credit has been determined, the pending credit will be replaced with the AU equivalent. EVAL HOL1 "Syllabus Needed for Evaluation"– AU credit has to be determined on an individual, case-by-case basis and we need the syllabus from the course to determine the equivalent credit. Turn in your syllabus to your academic advisor who will get it evaluated and updated on your transcript. EVAL HOL2 "Co-Req/Conditional Evaluation"– AU credit has to be manually reviewed on a case-by-case basis to ensure you have everything needed for credit. This is often the case where two classes from another school need to be taken in conjunction for Auburn to award credit (like a science lecture and lab). You will work with your academic advisor to have these holds cleared and the credit applied. GEEL 1000 – General elective credit-A general elective is given to a transfer course that has legitimate course content but Auburn does not offer a specific match. The course is essentially a free elective at Auburn. NOCR 1000 – No credit is given at Auburn University. This will often be seen for remedial courses that Auburn will not accept for credit. Your unofficial transcript will be updated as your credits are being evaluated or assigned credit. It is common to still have EVAL Holds or PEND credits on your unofficial transcript while you attend SOS. If you notice that you are missing an institution or courses, contact the Transfer Admission Advisors at 334-844-6441. They can help you check to see if a transcript was received. If your scores for any AP, IB, or CLEP tests have been submitted to Auburn, the credit will show on your unofficial transcript. If your scores are not listed, either have the testing agency submit your scores directly to Auburn University or send home report copies to the Office of the Registrar. Click here for AP, IB and CLEP Information. Frequently Asked Question: I feel that some of my courses may have been evaluated incorrectly. How do I challenge an evaluation if I believe there may have been a mistake? Please talk to your academic advisor (at or after the Academic Advising part of SOS) about challenging an Auburn course equivalency. If your advisor agrees the course may need to be re-evaluated, he/she will explain how to initiate the process.